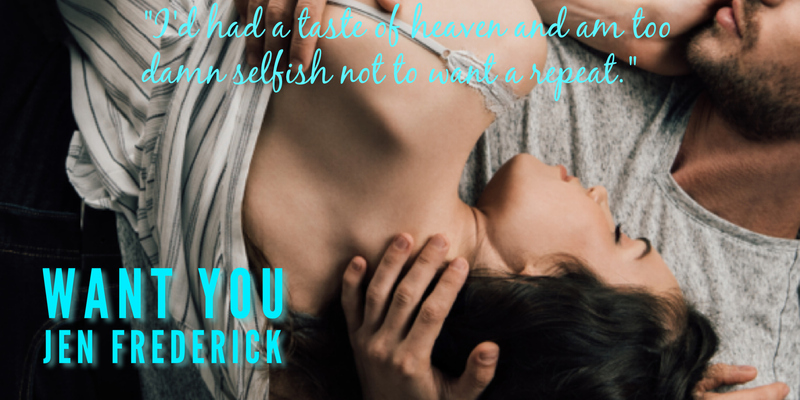 The synopsis of Jen Frederick’s newest release, Want You, doesn’t truly capture the depth and complexity of Leka and Bitsy’s story and all that they endure because while it speaks to what these two come to mean to one another after Leka saves Bitsy’s life when she’s merely a homeless little girl, there’s so much more to their relationship, to their development as individuals, and to the push and pull between them that only seems to intensify as the years they spend together increase and their bond solidifies into something bigger than they ever thought possible. But in my mind that’s the reason Frederick left her summation so vague, simply highlighting how Leka and Bitsy connected and how their relationship evolves, because she wants her readers to embark on this journey with her hero and heroine and experience it all as it happens directly from the characters’ perspectives, and while it might blindside some readers with all that Leka and Bitsy are exposed to and fight through, it essentially allows us to garner our own thoughts and feelings when Leka and Bitsy realize just how much they’ve grown to mean to one another and why one wants everything and the other one refuses to give in because of how that kind of relationship would be viewed. It’s easy to become emotionally affected by all that Leka and Bitsy go through at such a young age and because the author allows both of their voices to tell their story, readers easily become invested in the lives of these two characters and as their relationship evolves and their feelings for one another become so much more than what society might consider appropriate, because readers have been with the couple and witnessed everything that they have gone through together and how and why they have come to mean so much to one another, the only thing that matters to us is that these two deserve to be together in whatever way they want because without Leka, Bitsy would have never survived and without Bitsy, Leka would have never found his way into the light. There are two distinct parts to Leka and Bitsy’s story – the first one focuses on them working together to survive as kids and how Leka takes it upon himself to teach Bitsy the difference between good/bad and right/wrong and as he administers those lessons, Bitsy helps him to become a better person simply because he protects her with everything that he is regardless of what it might mean for his own safety. The other section of the story is less innocent and it has a much darker tone. There’s not only the forbidden aspect of Leka and Bitsy’s progressing relationship but there are also outside forces that must be dealt with and those shadows seem to always surround them, but these two have fought through so much to get where they are, which means that they’ll continue to do what needs to be done in order to keep each other safe and give one another the future they deserve. Want You has a completely different feel than any of the other Jen Frederick books I’ve read, and while it took me a bit to wrap my head around everything that happens in the story since it spans a few decades, its uniqueness is what made it an enjoyable and intriguing read, and it’s also what makes it more of an experience than simply a work of fiction and, in my opinion, a writer who explores a new aspect of her storytelling and successfully expands her writing repertoire is always worth taking a risk in reading something that readers may not equate with that particular author, and I consider Want You a win for Jen Frederick and for her readers.